Motril webcam or Motril web cam are digital cameras directly connected to the Internet. Some people also refer to these web camera as web cam Motril cams. Motril is a large coastal town an hour and a half’s drive east of Malaga International Airport. 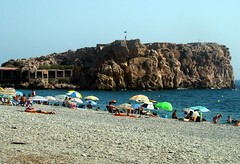 Motril is a bustling town with a port and two beaches. At the foothills of the Sierra Lujar mountains it is worth a drive inland up to historic Granada. Motril travel and weather webcams are constantly transmitting and streaming live video, pictures and images of Motril that you can see from your computer wherever you are in the world. Motril webcam – Webcam from Don Cactus Camping located at Carchuna near Motril. Please help us by suggesting any Motril webcams that you know of in order to build our list of webcams in Motril. Motril webcams are great for people who have never been to Motril and who want to see what Motril looks like.